Welcome to the first Official Offering from BratGuy Enterprises! Made to same specs as McClicky, so should work anywhere a riing in used to hold a boot in with a McClicky! This set will be slotted instead of having the tiny holes. Unfortunately, my costs went up considerable on this batch, so p[rice has been adjusted accordingly. Rings will be sandwiched between two index cards, and mailed in a small standard security envelope. 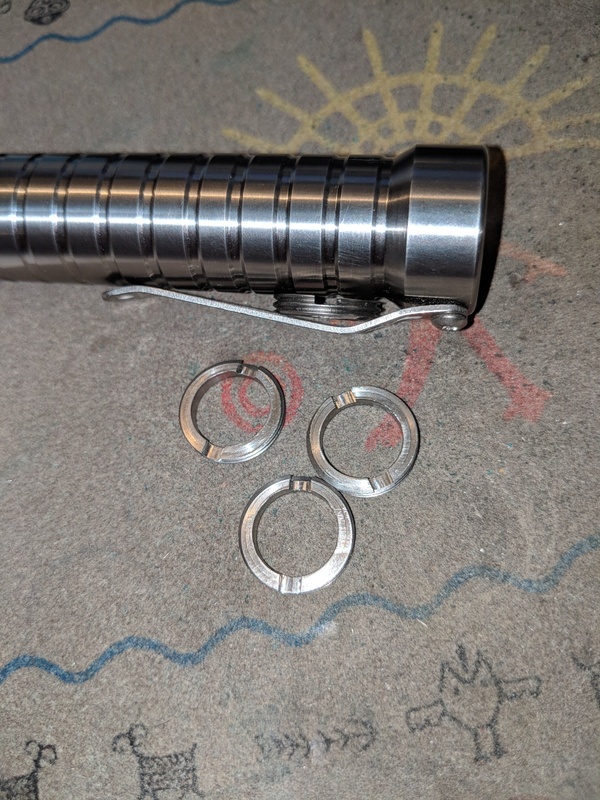 Created originally to fit Mac's Customs Tri-EDC and EDC lights, however these rings were made to the proper 11/16-20 UN thread specs, but it seems not all of Mac's lights were made to the proper spec. The McClicky switch is way under spec for that thread size, and it looks like Mac's lights were made to fit the undersized spec of the McClicky, but it varied from light to light. These have fit every copper light I've had, and most of the aluminum and brass, but not all. 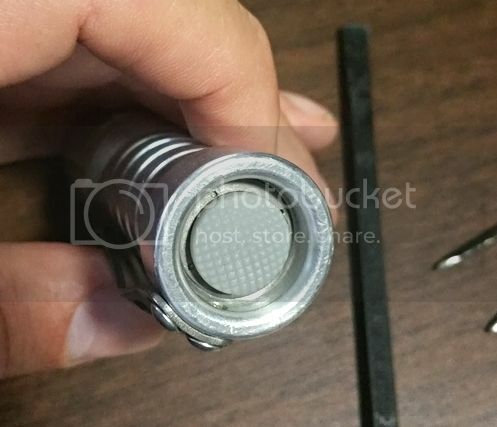 With the Brass or Aluminum lights, the internal threads could be cleaned up with a standard bottoming tap if you have access to one, or possibly you could use a small round file to flatten down the tops of the threads in the light. These rings will also work in the Sigma Customs lights, as Devin uses a tap for the threads, so they are to spec. I don't have a Hanko Trident to try them in, but in theory they should work in them as well if the retaining ring on them is to the thread spec, and not the McClicky specs (undersized). These are made basically the same way the stock Delrin ones were made, in that a long rod is bored and threaded, then each ring is parted off. because of this some look like the hole is not centered (just like the stock rings), but it's just an optical illusion because of where the threads are visible. 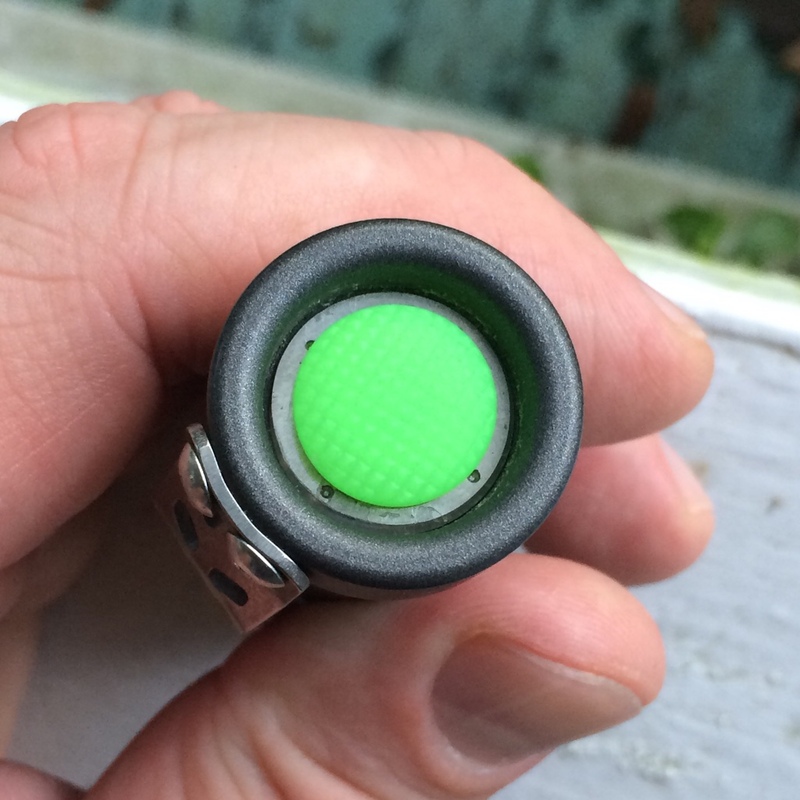 if you hold a ring up to a back light, you can see it's uniform. These just have 4 small holes to screw in with. size of the holes was a limitation because of the landing area with the threading, they visibly look smaller than the stock ones, but I've always used a curved nose tweezers for these rings, and it works fine for these as well. Blasted finish was just a test. a couple have marks from test fitting, and due to the nature of how these install, there won't be any more blasted ones. Last edited by mcbrat; 08-22-2018 at 11:47 AM. Ill take 2 x blasted & 1 x raw please! Last edited by DellSuperman; 08-05-2016 at 03:57 AM. Regarding the holes, you might consider a milled slot across instead of drilled holes. I'll take 2 blasted rings, paypal incoming. definitely was one of the options we were looking at. I have a sigma coming sometime soon. I'd like 1 blasted version. Paypal Sent. I also sent payment for a raw ring for one of my Mac's Customs. all items paid for already are going out this morning. In for 2 stone washed please. Last edited by benchrest; 08-06-2016 at 11:26 AM. Sigh. I wasn't going to do it, I don't really need it, but stone washed is nice. I'll take a stone washed, shipped to Canada. The delrin ring is my least favourite part of my sigma. Last edited by gunga; 08-06-2016 at 09:06 PM. Ill take one stonewashed. Paypal sent, Cheers! I'll take 1 raw Ti… PP sent. thanks. next batch is getting mailed out Tuesday! Hope I'll be fast enough on tuesday, then. may I reserve one mc? I'll take one Stone-washed ring. I mailed out 4 orders today. I have plenty. I did another batch of Stonewashed. What light is it going into? I have one copper tri and one Ti Mac EDC xm-l. Received - thanks McBrat Ent.! Perfect fit in an aluminum Mac , no-go as expected in a Ti EDC. oooh. I like that gray boot! Received mine yesterday, they are matched to thread spec as expected. Thanks Mick. Aluminum Bronze and Tellurium Copper, hand tapped so my host should be fine for any made to proper spec. Weird, wonder if this helps any. Raw Ti fit my cerekote just fine.